We’ve recently blogged about the Mystic Mall and Assembly Square Mall in Boston’s inner northern suburbs. 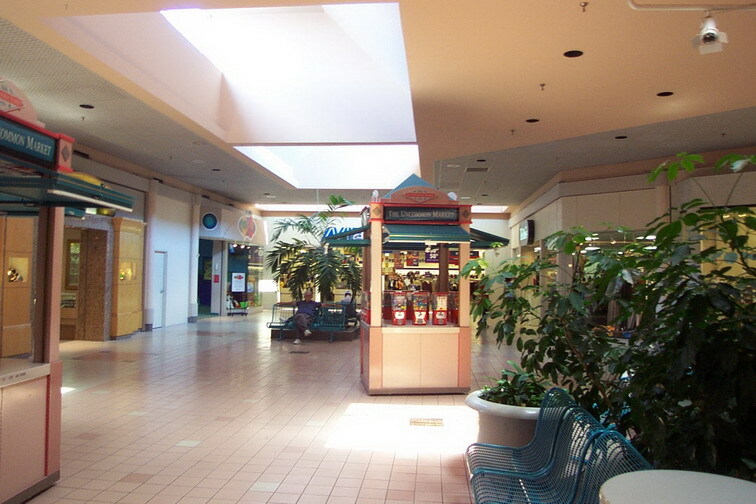 There’s a third mall that completes this particular mini-trade area: Medford’s Meadow Glen Mall. 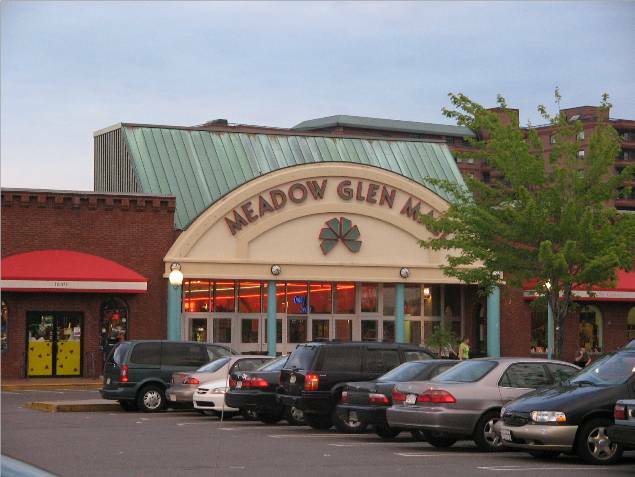 Of the three, Meadow Glen is by far the nicest and is the only one that remains open as an enclosed shopping mall. It is not, however, much larger than the others. Situated in a high-visibility location on Route 16 just east of the Mystic River and I-93, it’s at the western end of the Wellington Circle retail district. At about 400,000 square feet, the mall is a simple dumbell-style shopping mall anchored by Kohl’s and Marshall’s. Constructed in 1979 on the site of a former drive-in theatre, the center features a food court and lots of neon that’s indicative of its vintage. The different zones of the parking lot are even named after old movie stars as a nod to the site’s history as a drive-in theatre. 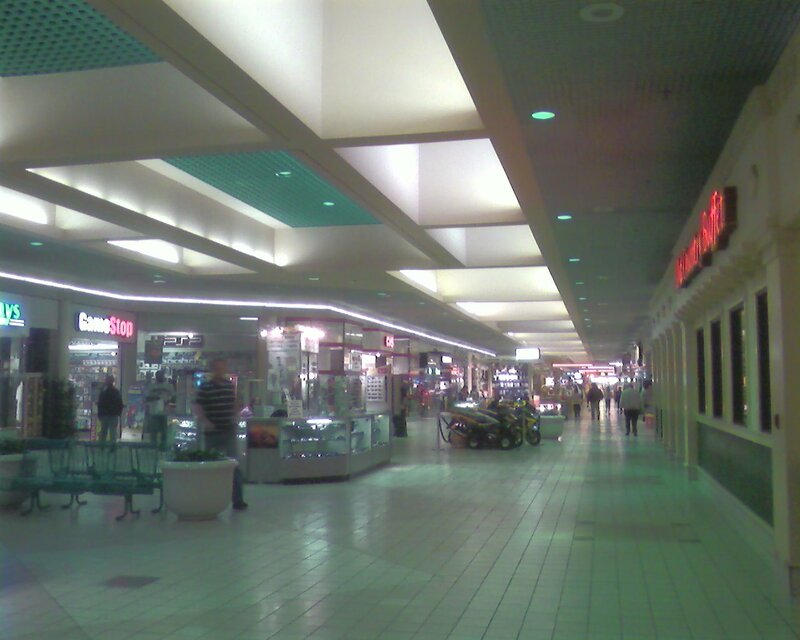 When Assembly Square Mall was still open, the two malls enjoyed a symbiotic relationship. 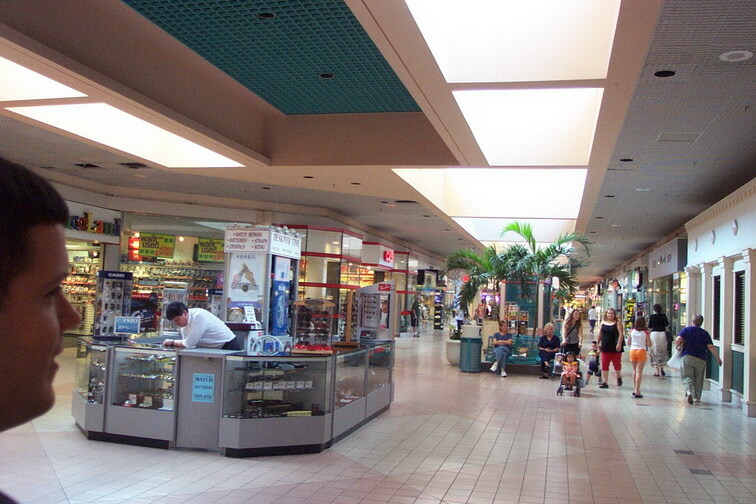 Assembly Square hosted Kmart and Jordan Marsh and Meadow Glen Mall hosted Bradlees and Marshalls, and each also had about 40 other stores and a food court. 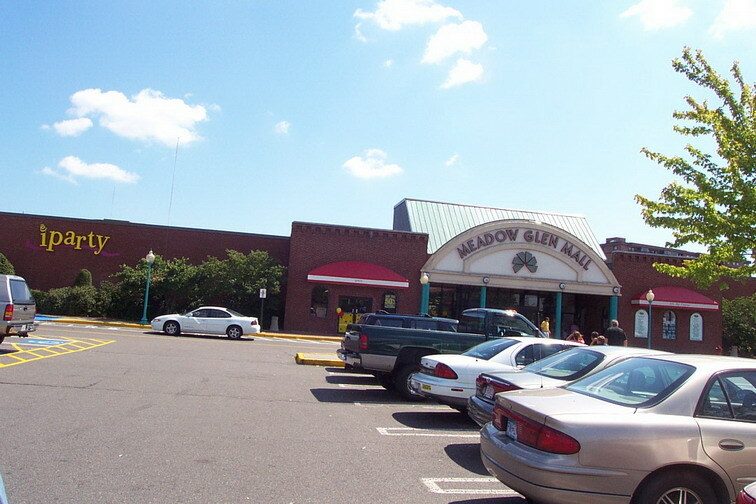 Realistically, Meadow Glen’s initial setback came with the death of its sister mall–because Assembly Square failed, the Wellington Circle area lost its cache as a shopping destination. So while Meadow Glen Mall still had some first-tier mall tenants like Express, the other half of the puzzle (retailers like The Gap) were no longer around because of the failures at Assembly Square. This meant that shoppers seeking a one-stop destination went to larger nearby malls in Burlington, Cambridge, Saugus, or Peabody. This would change in 2000, when the 600,000 square foot big box-style Gateway Center opened in Everett, about a mile to the east. 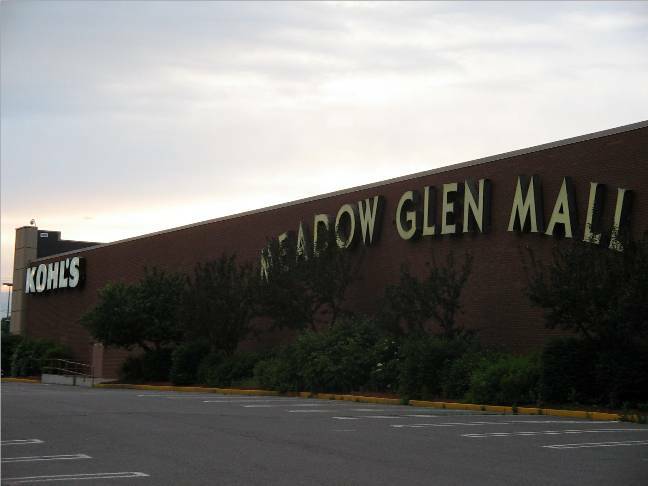 The center quickly became the center of retail activity in the area, and even duplicated several stores (Old Navy, Bath and Body Works, Famous Footwear) from Meadow Glen Mall. 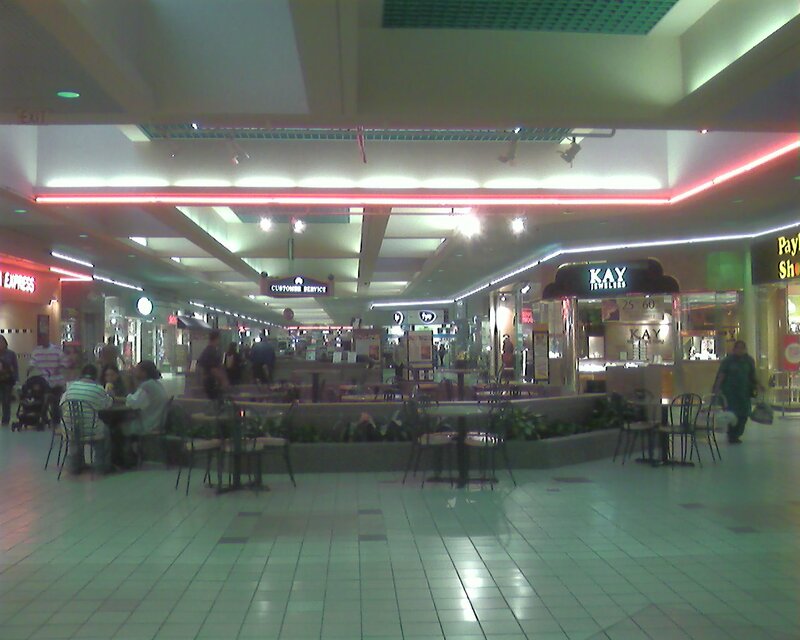 Then, in 2001, the entire Bradlees chain folded, causing the mall to lose its principal anchor. 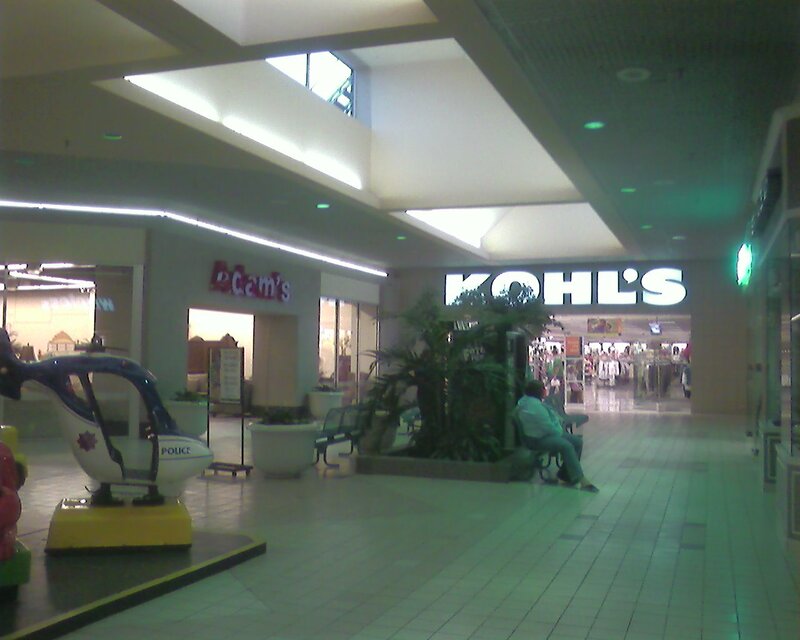 The space would remain vacant for about a year before Kohl’s opened a store in the Bradlees space. 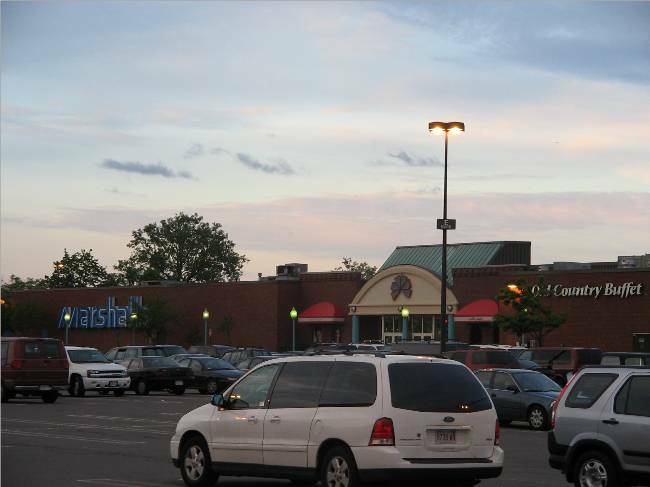 During that time, the mall would lose some tenants, including the aforementioned Express as well as the Old Navy store (one of Massachusetts’ first). Still, the mall remained mostly leased, and (apart from a few shifts, such as the swift arrival and departure of Pay/Half in the Old Navy space) the arrival of Kohl’s was a stabilizing force. Today, the mall remains mostly leased and is a pleasant smaller mall and an ideal example of what I often term “soccer mom malls;” convenience-oriented, slightly off-price, mid sized centers. I honestly don’t know why these centers aren’t more successful in dense suburbia because they put stores that require a large number of monthly visits in an environment that’s less time consuming than a larger enclosed mall, but which also provides pedestrian space and room for smaller, in-line retailers. In the past few years, retail has exploded around the Wellington Circle area, with the opening of the mixed-use Station Landing development and the re-opening of Assembly Square Mall as Assembly Square Marketplace, but demographic changes in the area and increased competition from other nearby centers have caused some slides in the quality of stores (Adam’s Furniture, a local store that has long occupied the former Kmart at the Mystic Mall, has moved into the former Old Navy space.) Because malls of this size and type are having a lot of difficulty, I hope to see it continue to thrive (and pull out of its current minor malaise), especially since its the lone remaining enclosed mall in its trade area. Also, check out this vintage-ish photo of the old pylon! Prangeway: Check out these pictures I took on August 24, 2001. A major difference is the announcement of Kohl’s coming to the mall. 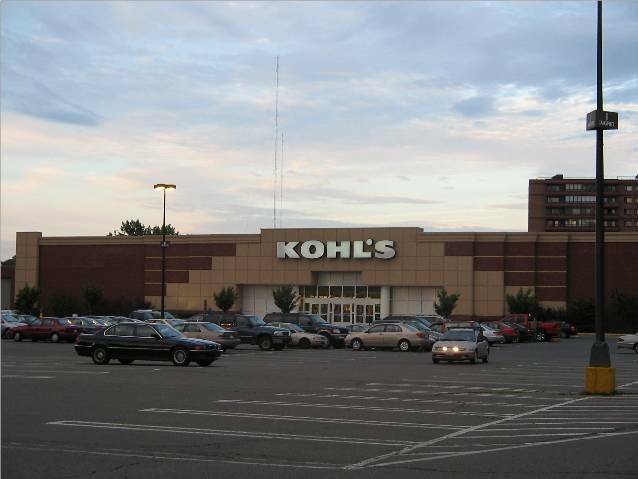 This was one of Kohl’s major expansions, taking over many former Caldor and Bradlees stores in the northeast United States. It wasn’t doing so well the last time I was there. The Papa Gino’s and the Panda Express had closed. Woah…I feel like I’m back in the mid-1980s with these shots. 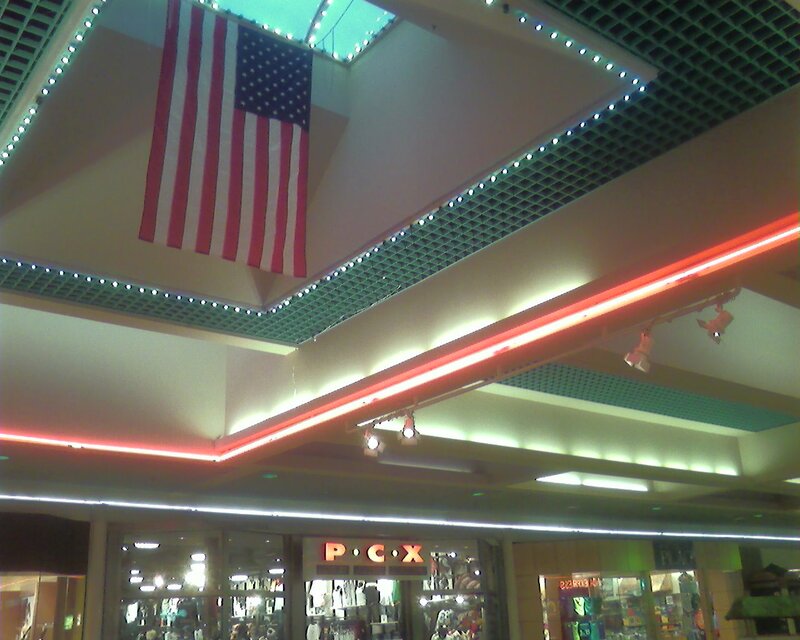 It was all about the neon and chrome back then, especially in these smaller enclosed malls. I’m also hoping it can pull through its current downtrend. Wisconsin had tons of these 200,000 – 500,000 Sq Ft. centers built in the late 1970s – early 1980s. Many have since closed, been turned inside-out, or are struggling today to survive. 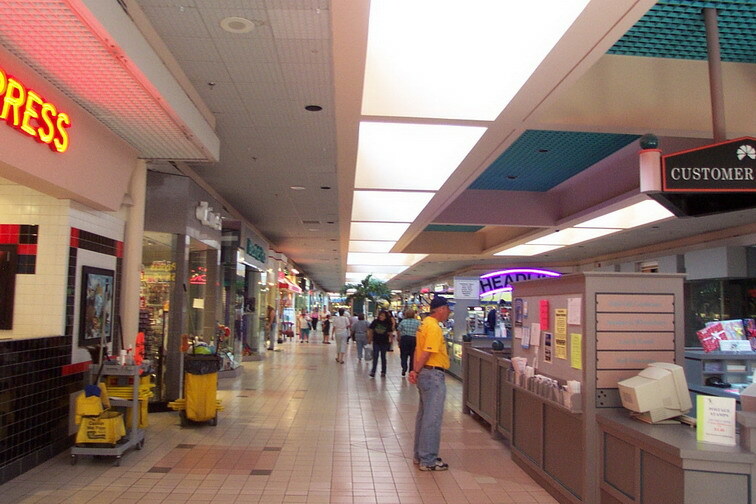 I actually worked in the Custom Wireless Store in this mall in the Summer of 01. I was a big fan of this mall as a kid, at one time it had a Record Town, a Pet Store, a Waldenbooks and a KayBee Toys as well. The (now closed) Panda Express was an Orange Julius for a long time. I distinctly remember seeing “The Monster Squad” at the Assembly Square Cinema and then going to the Meadow Glenn Mall for a Strawberry Julius afterwards. The iParty was formerly a Coconuts for a long time. oh my gosh im only 9 and i love shopping there cause right now im wearing earrings from CLARIES right now they rock yyyyyyyyyyyyyyyyyyaaaaaaaaaaaaaaaaa baby. CVS, fye, Waldenbooks have closed. BTW, speaking of Coconuts, has the parent company(Trans World) of Coconuts decided to convert all their former stores to either FYE stores, and/or closed all the remaining ones? It’s strange, since now whenever I go to their site(I did it once, just since I was bored), it now redirects people to the FYE site(unlike their other sister chains, such as Sam Goody, Suncoast, etc..). I’m guessing this did happen, since I’ve noticed almost all the Coconuts stores in the Chicagoland area in recent months have changed into FYE stores…..
Just in the past few months, the hapless TransWorld Entertainment has begun eradicating a lot of their stray banners, including the one-very-storied Strawberries banner here in New England. It seems to be moving slowly and haphazardly, but they’re all going away. It is 4:15 in the morning. I’m going to attempt to post all of my memories of this mall. It may be a bit unorganized, so please bear with me. When this mall was in it’s early stages, it had somewhat of an old cinema motif. On the top of the main entrance, a mural featuring many old movie stars could be seen if you looked up. This was a nod toward what the property used to consist of, a drive in theatre. The signs in the parking lot that feature movie star names also come from that era. The mall had the old wooden store fronts and red bricks that most malls had in the late 70’s-early 80’s, but that decor was revamped later to the blue and white tiled, neon look it has to this day. There was a York Steak House in the area where iParty is now. After York Steak House it became a Coconuts music store and then the iParty. The McDonalds at the end of the food court used to be located right next to the main entrance. It had an outdoor entrance as well as an indoor, as it was a regular sit down resteraunt back then. Not at all like the counter style McDonalds that is there today! The Friendly’s was remodled in the early 90’s. There was an Orange Julius where Panda Express now stands. Another cool thing the mall had in the late 80’s-early 90’s was a store where you could record yourself singing popular songs, karaoke-style (which I did quite a few times). I remember that the employees there were supposed to be record producer types. You could also film yourself lip syncing in a “music video”. 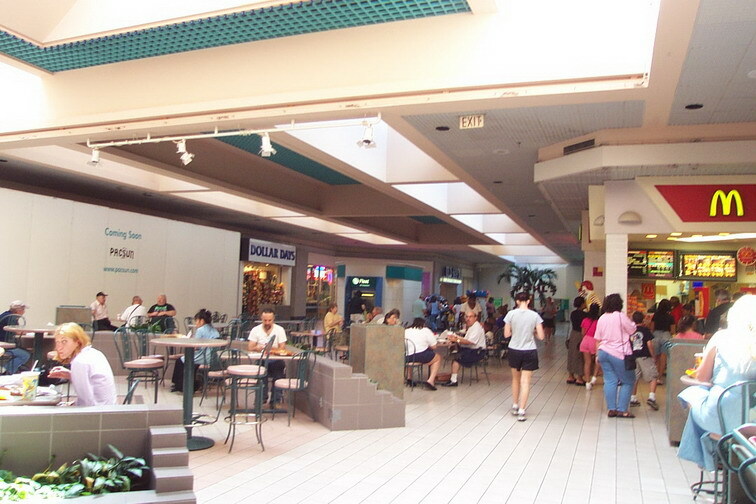 This store was named Center Stage, and it used to be part of a long wing that was later revamped as two or three larger stores as opposed to the five or so tiny stores that once occupied the same space. From my memory, the stores that took up the old wing’s space was Structure and Contempo Casuals. There also used to be a store that sold pianos and organs ( ! ), a tobacco store, a t-shirt store (where I got a lot of my old KISS merchandise) and a fountain that was located in front of Marshalls. 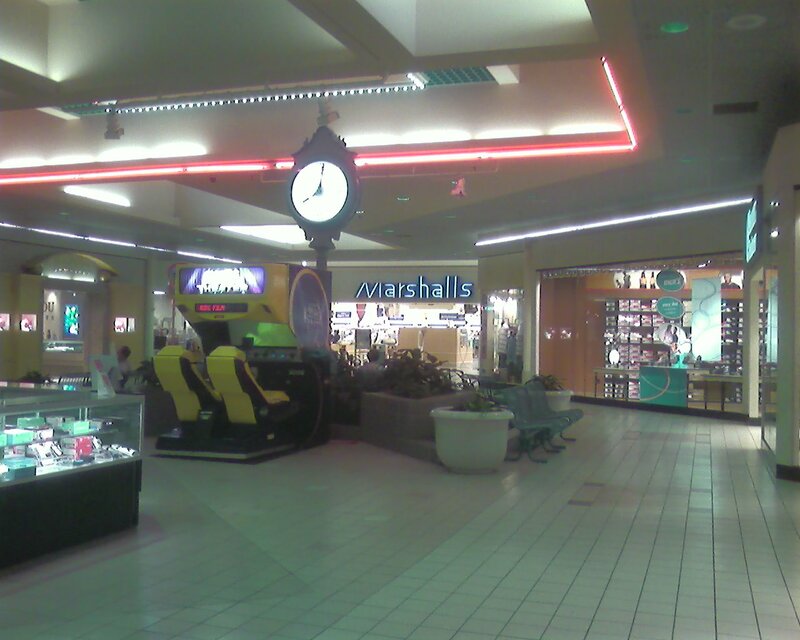 In the 90’s there was a newspaper stand-type place in the middle of the mall, and a play area for small children that was located right next door to Marshalls on the left hand side. There also used to be a Lechters right near where the video game store is now, and there was a Kinderphoto directly in front of Marshalls. I had many of my son’s earliest portraits done at this Kinderphoto. The mall regularly hosts a Halloween party, where all of the stores hand out candy to children in costume. This has been going on for most of the 90s, and sometimes the mall employees dress up as popular childrens characters such as Elmo from Sesame Street. In the 80’s, the mall also used to run a collectibles/memorabilia show every year. This show had tables that sold items like old baseball cards and music memorabilia. In the late 80’s/early 90’s, I seem to recall wrestler Randy “Macho Man” Savage signing autographs at the mall one weekend. I remember the posters for this event displayed all over the mall. I believe a Sesame Street actor or two has also visited the mall. Another interesting tidbit: there was a center in the mall that held lessons for playing various musical instruments. The store was run by the former drummer of Boston band Extreme, Paul Geary, and was named More Than Chords, a bit of a tribute to Extreme’s only number one hit, “More Than Words”. This store was around in the 1990s. I should also add, now that I have re-read what I wrote, that the organ store, tobacco store and the t-shirt store were in various spots in the mall, and not necessarily in the spot where the old wing used to be. Me again. In response to Bob, who wrote the first comment. Panda Express is not closed. It was renovated, not closed. Does anyome remember the name of the store at the Liberty Tree Mall in Danvers Ma that had really cool woman’s clothes close to the food court? iT had shoes in the back corner and was a very trndy place in the late 80’s early 90’s. M, are you talking about Hit or Miss, Federicks of Hollywood, or Debs? Speaking of Hit or Miss, whatever happened to them? Sea Lion Sushi, which has a store at Liberty Tree also, just opened a restaurant here. I like Sea Lion Sushi. When are you going to blog about LT Mall? LT is dying a little bit too. no, not any of those. It was a really cool store i believe in the spot where teh pet shop is now. thanks though. @m, Quite a few years late lol but I think the store you are talking about was Tello’s. 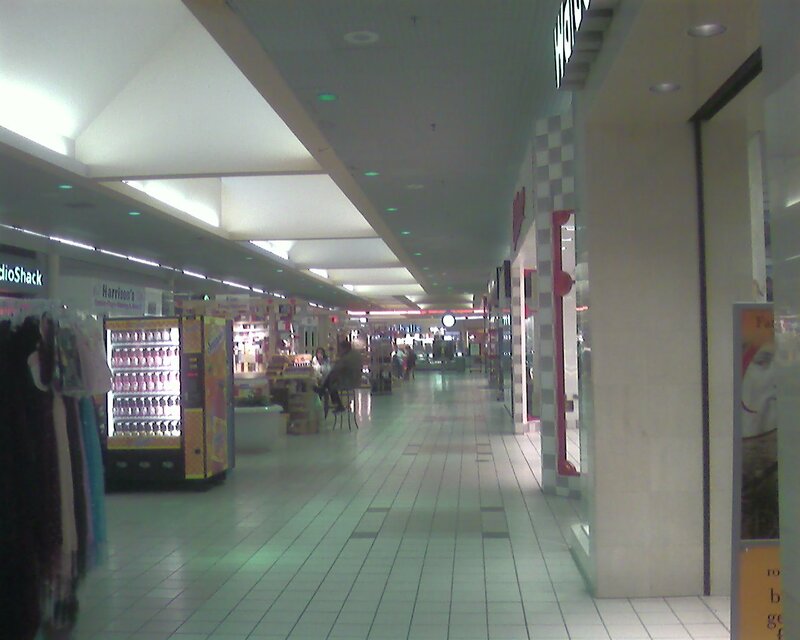 The last few times I’ve gone into this mall they’ve had a horrible sewarage smell, just awful. Nobody else in the mall seems to be noticing it though. Also Harrison’s Comics has moved into the old FYE space. John, I recently visited Sea Lion Sushi in Meadow Glen. I found the food to be rather tasteless and bland, myself. Whatever happened to the PacSun Store that was advertised as coming soon in one of the pictures? Did it ever open? How long was it there? That PacSun store lasted a year or two at most. 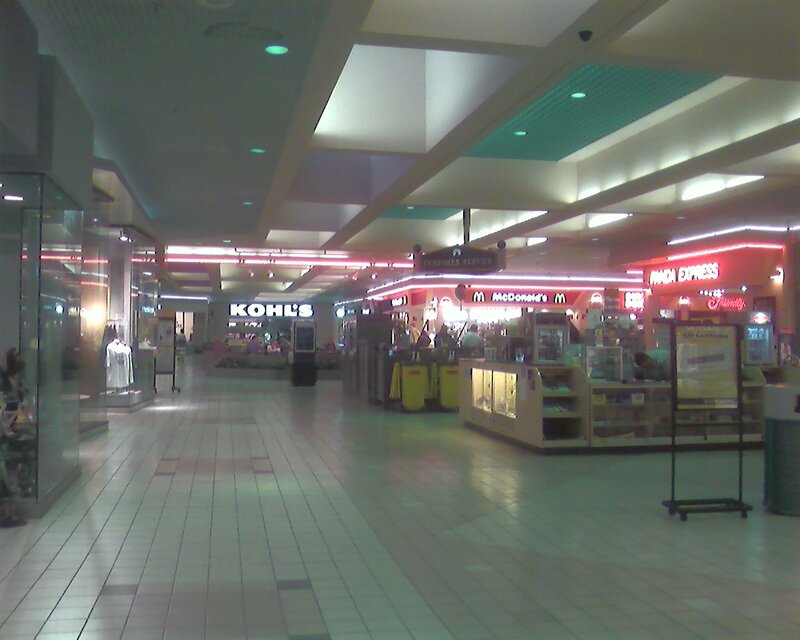 That photo was taken in 2001 (before Kohl’s even opened) and it was replacing an Express store that had closed. Notice that there’s an Old Navy in the background of that same shot; that store also closed a few years later and was replaced by Pay/Half and then later Adam’s (as seen in the 2006 photos) which is a local, kind of downmarket furniture store. You are all forgeting the Underground Camera stores, they were in almost every mall including Assembly Square and Meadow Glen. The one at Meadow Glen was at the old wing that use to have an entrance out the back (now closed in). I believe when they first built it they were going to expand out the back to another building and it never happened. wow I spent a lot of time bother here and the assembly Square as a kid. The card store, bradlee’s (I swear half my toys were from bradlee’s haha), the friendly’s and orange julius withe plastic oranges imbedded in the counter.. “dad how’d they get all those oranges in there??? ?” and I remember meeting my dad after work there to eat at York Steak House. I rember when it was revamped to “York’s” and the modernized it and I was bummed becuase I liked the old tacky medievil decor they used to have. This is one great mall, it’s just too bad that it’s lost it’s former glory. I will also try to convey some of my memories.I have vague memories of the Coconuts music store, the Papa Gino’s that was there, the time Friendly’s caught fire, the time Oriental Arts and Crafts caught fire, the Wilson’s Leather that was there, when Funcoland first opened, the PacSun that was there, the Bradlee’s that used to be there. I also remember the Express, The K.B. Toys that used to be there, When Gamestop absorbed Funcoland, then moved quite recently, When Coconuts moved to where Harrison’s is, then FYE absorbed it, then FYE closed, then Harrison’s moved from Salem to the mall. I remember the Old Navy (which is where I bought all of my boyhood clothes), the Pay-Half, and Adam’s (which is moving to a bigger store in Everett. ), and when Kohl’s opened. The only things keeping it alive are the Harrison’s, Gamestop, and Kohl’s. 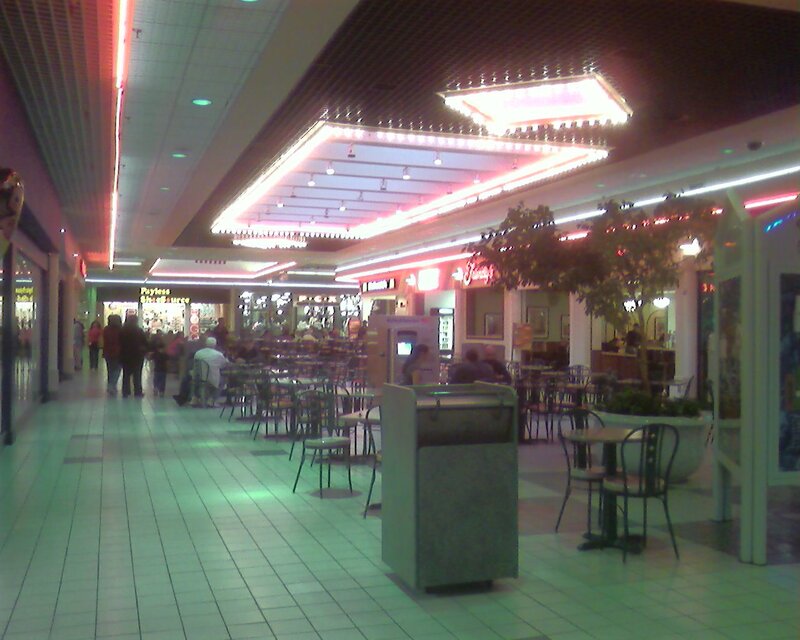 I was so into this mall, that I used to go there every Halloween to get candy from the store clerks. Remember TELLO’S and CHESS KING?!!! I still remember buying red parachute pants with the zippers all over them from Chess King, back in 1983. I thought I was sooo cool. Yikes. I used to work at the Kinney Shoe Store in the mall, which was to the right of Bradlees, back in 1987. I am embarrassed to say that I forget the manager’s name, but he was a really great guy. Oh, yeah, there was a furniture store in the mall at that time that sold very blocky furniture, with a very unfinished wood look to all of it. It was considered very trendy at the time. Anyone remember the name of it? And, off-topic, but remember the Dapper Dan;s Restaurant at the Assembly-Square Mall? @David in Chelsea, MA, the store was called This End Up. It was a chain as there was an outlet in the Maine Mall. This mall seems to be picking up business again. There are two different “open box”/junk stores in there now, one in the old CVS and another in the old Walden Books. Also a discount furniture chain have moved into the former Old Navy. There’s also a used book store in the former Harrison’s space. I went last week and it seemed pretty busy for a week day. I can’t believe nobody mentioned the old water fountain! I used to sit next to it with my parents as a kid and throw pennies into it! I liked it better when it was a drive-in…. McDonald’s closed here a few weeks ago. The Shaw’s supermarket across Locust Street from the mall is also closing next week. This mall is sooo sketchy. Its lovongly referred to as the Ghetto glen. Just a quick update on this mall. The mall has announced that as of February 1, 2016, it will close it’s door for the addition of a Wegmans. Marshalls and Kohl’s will remain open however. I personally do not know if they will demolish the middle section or renovate it.